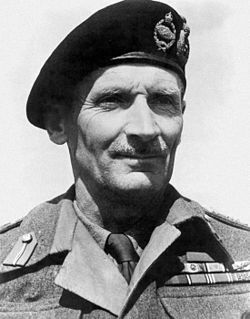 Bernard Montgomery (1887-1976) British Army Officer who, during the Second World War, led the army to victory at El Alamein – the first major Allied victory of the war. He later played a leading role in commanding the Allied landings in Italy and France. 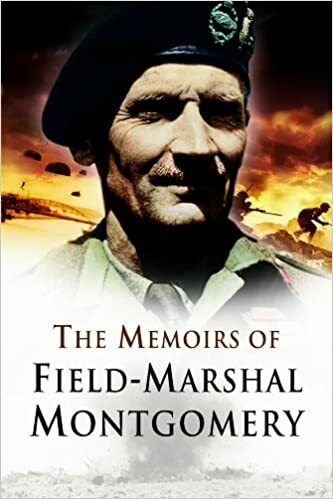 Bernard Montgomery or ‘Monty’, as he was affectionately known by his troops, was one of Britain’s greatest generals, delivering the Allies one of their first significant victories in the Second World War – defeating the Germans at El Alamein. He went on to lead Allied troops in the invasion of Italy and later France. Montgomery was a complex character. He was undoubtedly a great military thinker and leader who could see the essence of situations and simplify the most complex problems in an easy to understand way. His simplicity and directness, combined with a strong sense of self-belief made him an effective military leader, but it also created conflict with those around him – especially other generals and politicians back in Westminster. Yet, to his troops, Monty was a living legend – a general they had great faith in. This faith in Monty was well justified as he took meticulous care to look after the troops in his command. When Montgomery was asked which three generals he admired most. He answered with his customary precision – “the other two would be Alexander the Great and Napoleon.” Monty was never one to be criticised for false modesty. Montgomery was born in Kennington, London in 1887. His father was a deeply religious man and his mother very strict. His upbringing could be described as disciplined – in the classic Victorian style of his social class. Undoubtedly, this upbringing contributed to his aloofness in later life. Montgomery threw himself into sports and was a natural sportsman and was always seeking to be a leader of men. After school, he went to Sandhurst to train in the army. He graduated and was sent to the North West frontier of India. Slowly, he became more thoughtful about the way to get on with fellow officers, but he never lost his ability to be argumentative with others. At the end of the war, Montgomery continued his career in the military. In 1927, he also married a widow – Betty Carver, with whom they had one son. The marriage was happy for Monty giving a rare period of emotional closeness. Tragically, his wife died in 1937 after an insect bite turned septic. 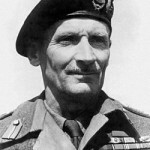 During the Second World War, Montgomery was elevated to Commander of the Eighth Army in Egypt. In 1942, Britain had always been on the back foot in the war. About the best the Allies could claim were successful tactical retreats like Dunkirk, or holding the enemy as in the Battle of Britain; but on the land, the army had few real victories. In the African theatre, Monty’s adversary Erwin Rommel was gaining near-mythical status (amongst both German and British soldiers) about his seeming invincibility. “I want to impose on everyone that the bad times are over, they are finished! Our mandate from the Prime Minister is to destroy the Axis forces in North Africa…It can be done, and it will be done! ” – Montgomery speaking to his troops. Montgomery in a Grant tank. After beating off a German attack in August, Monty was able to deliver a successful counterattack in November. It was a decisive victory for the allies and was celebrated back home. It was said that before El-Alamein – the Allies never had a victory, but after El-Alamein the Allies never had a defeat. It was not quite as simple as that, but it was a crucial turning point in the balance of power in the Second World War. This famous victory elevated the status of Monty. He already had a certain ‘cult’ status amongst the mass of army recruits. They admired his somewhat unorthodox and eccentric habits. – For example, the way he dressed and his disdain for tiresome military procedures. After El-Alamein, he became a major celebrity in Britain, and crowds would often flock to great him. In 1943, he took part in the Allied landings in Italy and, after hard battles, the Allies succeeded in pushing the Axis powers back. In 1944, after much preparation, the Allies finally launched their long-awaited invasion of Western Europe landing on the Normandy beaches. During the long drive East towards Germany, Monty often clashed with the American, General Eisenhower. Monty was keen for a decisive single blow on one part of the front. Eisenhower wanted a broader general advance. Politics dictated Eisenhower would be the supreme commander (American troops outnumbered British 2:1) and with good grace, Eisenhower would argue with Monty until he got his own way. Eisenhower was generous towards Monty, certainly more so than General Patton. To some extent, Monty did have his opportunity with operation Market Garden – a daring paratroop drop deep into enemy territory. It was hoped this would enable an early capture of important Rhine bridgeheads and speed up the war. Unfortunately, the plan was overly optimistic, and the ambitious targets were not achieved. He later blamed a combination of factors such as lack of support, bad weather and unexpected resistance. 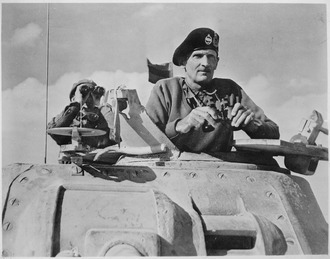 However, Monty redeemed his reputation in the way he saw off the German winter counter-offensive of 1944-45. After the war, Montgomery remained active in the military planning. In 1951, he became deputy Supreme Commander to General Eisenhower in NATO. He toured many countries sharing his blunt opinions, in a way few others could. He died from unspecified causes on 24th March 1976 in his home, near Alton, Hampshire. Marshall Viscount Montgomery of Alamein, KG, GCB, DSO. Citation: Pettinger, Tejvan. 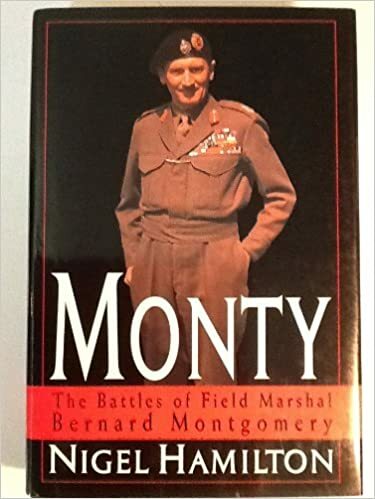 “Biography of Bernard Montgomery”, Oxford, UK. www.biographyonline.net, Published 1st Feb 2010. Last updated 30th January 2017. Famous military figures – Famous military leaders and soldiers, including Alexander the Great, Napoleon, Ataturk, Erwin Rommel, Winston Churchill and Dwight Eisenhower.